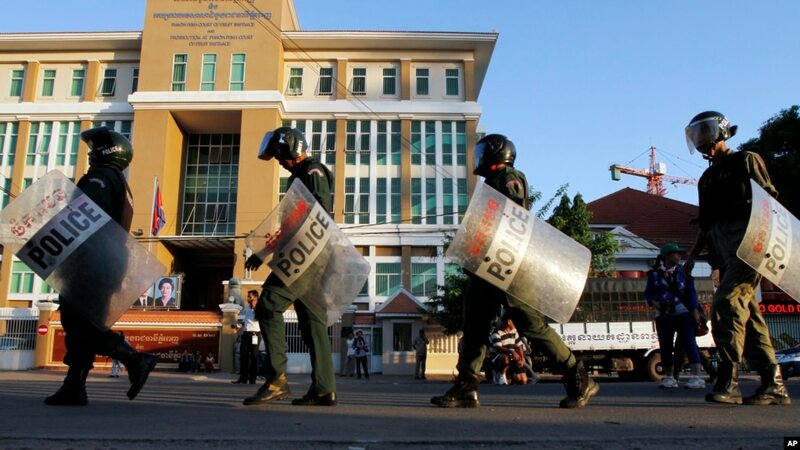 FILE – Cambodian riot police officers walk in front of Phnom Penh Municipality Court in Phnom Penh, Cambodia, May 30, 2014, after the court convicted almost two dozen factory workers and rights activists for instigating violence. The European Union is threatening to withdraw crucial trade preferences if Cambodian Prime Minister Hun Sen does not reverse a prolonged political crackdown. BANGKOK — Cambodian Prime Minister Hun Sen is facing economic pressure to reverse a recent crackdown on opposition groups and basic freedoms in his country. The EU told Cambodia on Friday it will lose duty-free access to the world’s biggest market within 12 months for its “blatant disregard” of human and labor rights standards attached to trade preferences it is granted as a developing nation. Unless the government takes significant actions to redress an autocratic backslide including reinstating the country’s banned opposition in the next six months, the “Everything But Arms” (EBA) preferences will be withdrawn. “This could be disastrous. I mean, if I were an investor looking at certainly the garment sector I would be very concerned about now,” said political economist Sophal Ear, an associate professor of diplomacy and world affairs at Occidental College in Los Angeles. “I would pause any expansion plans because it would be like wait, things could go completely haywire,” he said. Moeun Tola, Executive Director of the Center for Alliance of Labor and Human Rights, said a huge number of workers would be forced into unemployment and the ball is now in Hun Sen’s court. “If the government really care about the nation and our people, they should reconsider the demands/recommendations from EU,” he said. FILE – Cambodian garment workers sew clothes in a factory in Phnom Penh, Cambodia, Aug. 4, 2007. 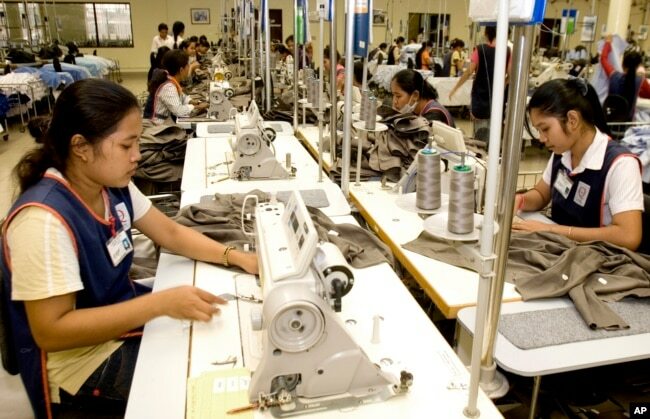 Garment manufacturing is Cambodia’s biggest industry, accounting for about 40 percent of the gross domestic product and some 800,000 jobs, while the EU is by far its largest export market, absorbing almost $6 billion worth of goods last year according to its own figures. Preferential access to that market is seen by some of Hun Sen’s critics as one of the few meaningful negotiating chips to counter an autocratic leader increasingly emboldened by Chinese support. “No matter what measures they want to take against Cambodia, in whatever way, Cambodia must be strong in its defense of its sovereignty,” he said in a post to his Facebook page Monday. 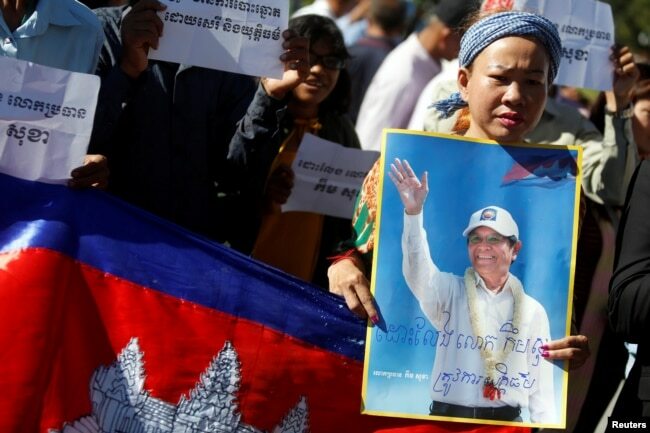 In the lead-up to Cambodia’s July election, Hun Sen claimed defense of the national sovereignty necessitated the banning of the opposition Cambodia National Rescue Party — which he said was made up of agents of malicious foreign governments — and the jailing of its leader Kem Sokha. FILE – Supporters of Kem Sokha, leader of the Cambodia National Rescue Party, stand outside the Appeal Court during a bail hearing for the jailed opposition leader in Phnom Penh, Cambodia, Sept. 26, 2017. Political analyst Ou Virak said Hun Sen’s public defiance of the EU was predictable, though privately discontent was brewing among the premier’s inner circle and vast network of rich benefactors. 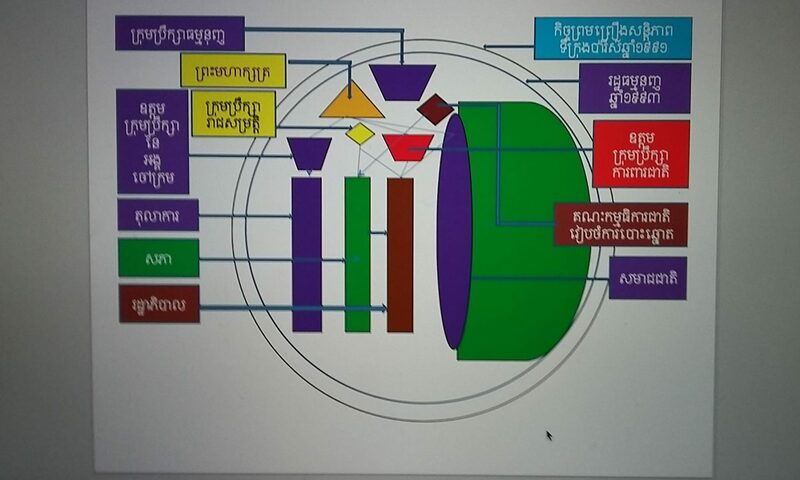 “You have to understand Hun Sen. He wants to save face, he doesn’t want to appear that he’s a pushover and so he will try to do it in a way that it seems he didn’t give much or he didn’t cave in,” he said. Moeun said that pressure could stretch all the way to Beijing, stressing that as the biggest investors in the Cambodia’s garment factories, Chinese investors stood to lose heavily should the industry collapse. A severe knock-on effect would be felt in Cambodia’s microfinance industry as well, because so many garment workers were indebted to such institutions, Tola warned. “Both micro-finance and banks will be hard to grab their assets in order to pay off the loan as there will be protest or chaos to do that,” he wrote. “So the household depends largely on their children who work in the garment sector so that becomes a high risk for the microfinance sector,” he said. 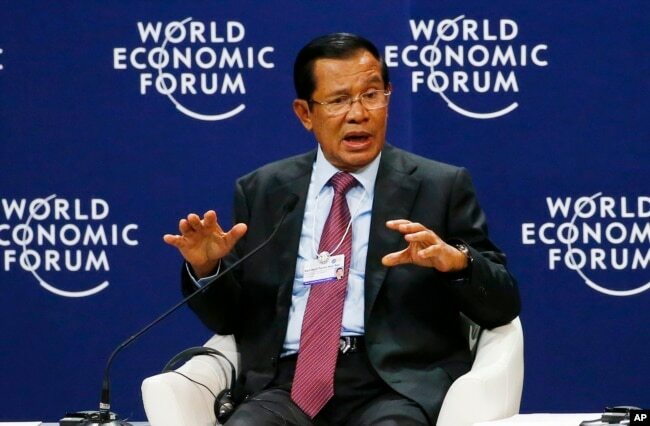 FILE – Prime Minister Hun Sen of Cambodia gestures as he talks about his vision for the Mekong region in the World Economic Forum on ASEAN at the National Convention Center in Hanoi, Vietnam, Sept. 12, 2018. “The key is to cause the actions you desire in the next six months before sanctions actually begin and to have the same effect so that you don’t actually punish Cambodia or Cambodians in particular who don’t deserve to be punished for the actions of their leaders. “Then you don’t have to tank the economy. But that would be the result of anything of the sort that is being proposed,” he said. The U.S. has also initiated concrete punitive action against Hun Sen’s regime, sanctioning one of his top commanders in June. Many more members of his inner circle could follow under the Cambodia Democracy Act of 2018 — a targeted sanctions bill which was passed by the U.S. House of Representatives in late July. “Other allies will follow,” he wrote.